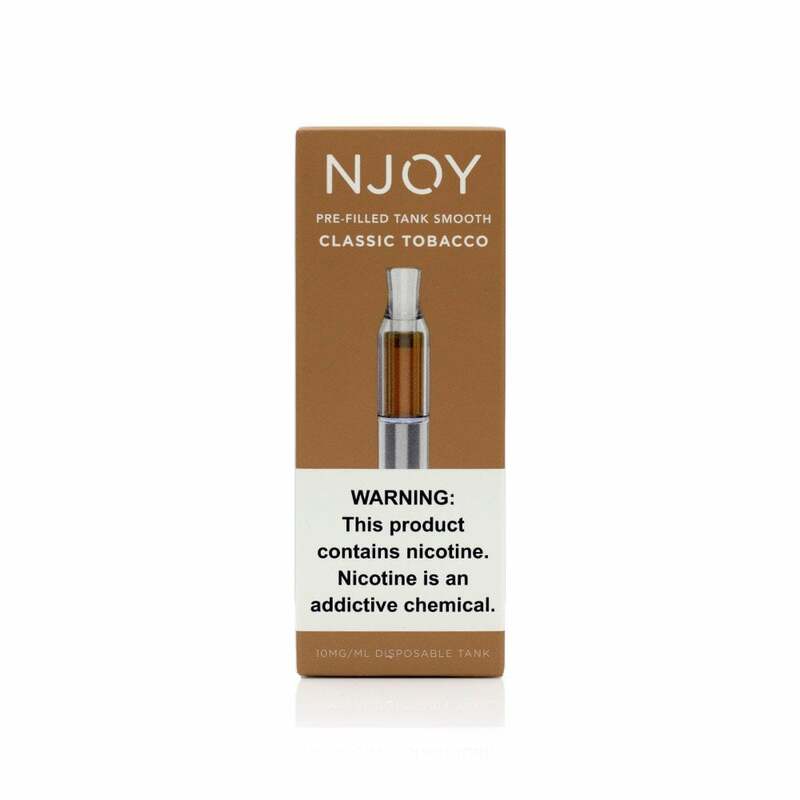 If you're a fan of the NJOY Daily E-Cigarette but would prefer bigger clouds and a liquid-based vape, then the Classic Tobacco pre-filled tank by NJOY is most definitely for you. For those unfamiliar with the flavor, it's a robust but smooth tobacco flavor with a subtle, sweet finish. Great flavor and a real bargain for the 10 packs. They never disappoint. Love the smooth tobacco flavor and they are long lasting for me. Just started using vape from cigarettes. Thought I needed something stronger but these are a tad too strong. Wish there was a 20 MG. 15 seems too weak and 25 seems a tad too strong. My fave flavor. Not too sweet. Just the right amount of flavor. Lasts a long time so worth the money!! Something changed in this oil or I received bad product.Dark color and bad taste.Went to trash..
Njoy went bankrupt and will sell this product until stock is depleted. I've been using these for a few months and they are my new favorite vapes. However, in my most recent order the packaging and vape liquid have changed slightly. They have new boxes (which are much less attractive than the old ones), and the vape liquid is much lighter color, almost clear. The flavor is slightly different, although still good. I wish they would just leave good things alone though. I liked the product slightly better before the changes. I had to switch from FIN which I liked the taste of Bold tobacco. Fin was always running out of stock. Tried Njoy, I loved the lighter tobacco refills. I have not received any leaking refills and they don't taste like cigars. I like using these as they are easy to load, use, and transport. The value is great for the money and you can longer without having to refill. I previously used the Vuse Vibe and was disappointed by the recall. Based on the recommendation from Electric Tobacconist I tried the nJoy prefilled and was very impressed the volume of the vape as well as the log lasting battery. I have tried Juul's, myBlu and rate the nJoy prefilled tanks superior and better value for money. These are now my favorite tanks. I was a previous Vuse Vibe user, but these are better. Easy to use website. Product true as advertised. Received product sooner than expected. I am an extremely satisfied customer. Note: I can often buy at Walgreens on sale for less than I can buy online. I wish there were more online discounts. Price was great, shipping time excellent, and product very good. I tried many different brands to find a good replacement for my Vuse Vibes, and this is the one I like best. The NJOY Pre-Filled Tank (Classic Tobacco) has a nice flavor and the cartridges last a good while. It's not quite the same as Vibe, but it's just as good. I also like it because it leaves no smell when I'm vaping, as many of the other brands do. Making a switch takes a little getting used to, but I'm now very pleased with these. I accidentally bought these a year ago and I fell in love with them. This is the only product I buy now.